Of course, not a single piece of this cake was eaten. There are two pieces left of the other two cakes. Just like a puzzle, she can assemble 8 pieces that have already been cut into a whole cake! This will not really save the situation, but it will certainly be fun. There are ten pieces of cake. Eight pieces are needed for a whole cake. Since 8 fits into 10 once, it is enough for 1 cake. 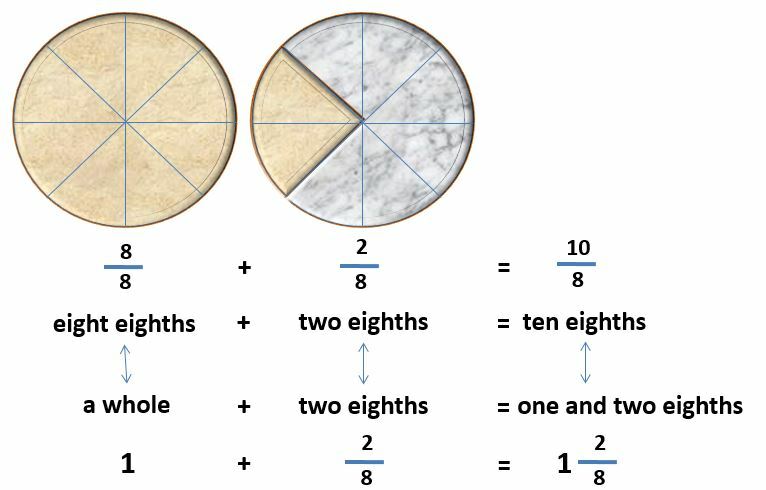 The denominator indicates how many pieces the whole cake was divided into. This is the same in both notations! The numerator states the number of pieces. In addition to the whole cakes, there are 2 pieces. If the side calculation is working, this whole number is the result! The result is 4 Remainder 1. Be aware that only improper fractions can be converted into a mixed number. Proper fractions cannot be converted to mixed numbers, because the whole number part of the mixed number would be zero: In this case, dividing the numerator by the denominator always results in "0 Remainder numerator. If you have any problems with the excercise, please have a look at the hint and the sample solution first. Let's continue with: "Reciprocal of a Fraction"